Jacob and Maria (Funk) Braun, 1926. Preserving photo. Jacob Braun: civic leader; born 28 March 1853 in Friedrichsthal, Bergthal Colony, Russia to Jacob Braun and Katherina (Funk) Braun. He was the third of eight children in the family. He was baptized on 28 May 1873 in Russia and immigrated to Canada on 27 July 1875. 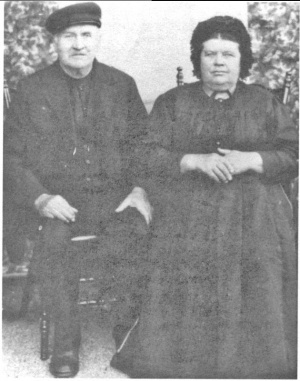 He married Maria K. Funk (1859-1930) on 31 March 1878 in the village of Gnadenfeld, Manitoba. The couple had 11 children, two of whom died young. He is remembered as the first auditor of the Rural Municipality of Hanover. He was also an influential person in the decision of the Chortitzer Mennonites to leave Canada for Paraguay in 1926; for the Brauns, the venture only lasted three years, but cost the family much of their accumulated wealth. They returned to Canada only three years later, in 1929. Jacob Braun died on 31 August 1941 in Grünthal, Manitoba. Braun, Ernest. “House of Jacobs.” Preservings No. 11 (December 1997): 61-63. GRANDMA (The Genealogical Registry and Database of Mennonite Ancestry) Database, 5.03 ed. Fresno, CA: California Mennonite Historical Society, 2007: #185173. Huebert, Susan. "Braun, Jacob (1853-1941)." Global Anabaptist Mennonite Encyclopedia Online. October 2007. Web. 26 Apr 2019. http://gameo.org/index.php?title=Braun,_Jacob_(1853-1941)&oldid=94115. Huebert, Susan. (October 2007). Braun, Jacob (1853-1941). Global Anabaptist Mennonite Encyclopedia Online. Retrieved 26 April 2019, from http://gameo.org/index.php?title=Braun,_Jacob_(1853-1941)&oldid=94115.